Newlyweds Nicole and Chad’s unconditional love made for the sweetest summer wedding. 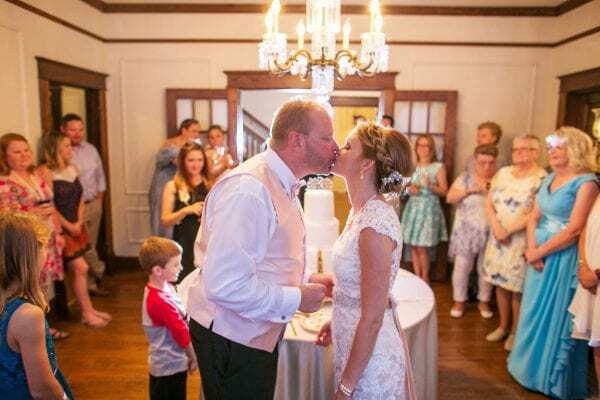 They tied the knot in an intimate affair in front of family and friends in our Franklin, Tennessee garden on a sunny summer day. The bride’s beautiful lace dress featured buttons all the way down the back and a sweet satin bow, creating an elegant and timeless look next to her groom dressed in a charcoal suit. Nicole’s son was lovingly involved in every aspect, from adorably helping his mom get ready in the bridal suite to walking her down the aisle. There wasn’t a dry eye in the garden! In lieu of a guest book, family and friends signed a custom canvas printed with the couple’s home states and adopted the state of Tenneesse. The heartfelt ceremony in the garden led to a joyous reception in the pavilion, where tables were adorned with mercury votive candle holders and gold lanterns surrounded by ivory and blush roses. For dessert, a three-tier stunner of white on white details, including a “G” at the top for the newlyweds’ last name! A beautiful summer wedding captured by the talented Krista Lee Photography – thanks for sharing these photos!